Writing an Android Sync Provider: Part 2 – Did You Win Yet? Similar to our Account Authenticator service, our Contacts Sync Provider service will return a subclass of AbstractThreadedSyncAdapter from the onBind method. //This is where the magic will happen! Finally, we need an xml file to let Android know that our sync provider handles Contacts for the Account type we defined in part 1. At this point we have a sync provider that doesn’t do anything, but also shouldn’t crash the Android system. Just in case, lets test it in Dev Tools first. 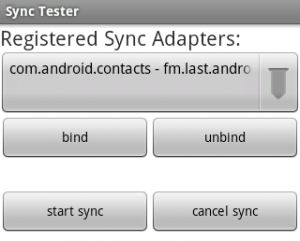 Start the Android emulator and launch the “Dev Tools” app, then scroll down to “Sync Tester”. 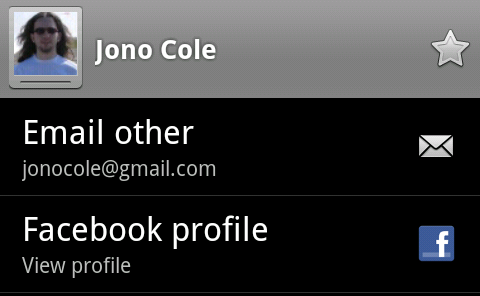 The drop-down should confirm that com.android.contacts can be synced with the account type you’ve created. Select the entry for your account type and press the “Bind” button to connect to your sync service. If all goes well, Sync Tester will say it’s connected to your service. Now click “Start Sync” and select your account from the popup. Sync Tester will let you know that the sync succeeded (even though we didn’t actually do anything). At this point it should be safe to enable contact syncing from the Accounts & Sync settings screen without Android crashing and rebooting. Lets take a moment to discuss how Contacts on Android work. Each sync account, such as Google or Facebook, creates its own set of RawContacts which the Android system then aggregates into the single list of contacts you see in the Dialer. The RawContacts table contains several fields that Sync Providers can use for whatever they like, and in this implementation we will use the SYNC1 field to store the RawContact’s Last.fm username. Data, such as name, phone number, email address, etc. is stored in a table that references a RawContact ID. The Data table can contain anything you like, and there are several predefined MIME-types available for phone numbers, email addresses, names, etc. Android will automatically try to combine RawContacts that contain the same name, email address, etc. 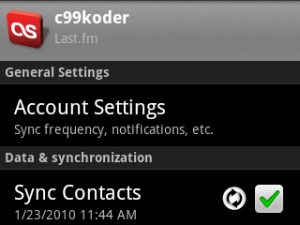 into a single Contact, and the user can also combine and split Contacts manually from the contact edit screen. This ContactsSource xml file will tell the Contacts app how to format our custom MIME-types. In the example below, we specify an icon, and tell the Contacts app to use the DATA2 and DATA3 columns to render the fields. Note that this file’s format doesn’t appear to be documented outside of the source code for the Contacts app. Now lets put all the above information together to create a RawContact for a Last.fm user. Our contacts will display only a name and a custom field that links to the user’s Last.fm profile. We store the user’s username in the RawContact’s SYNC1 field so we can easily look it up later. We will batch together the creation of the RawContact and the insertion of the Data, as Android will run an aggregation pass after each batch completes. 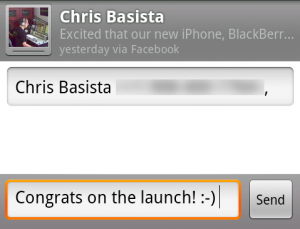 Android keeps another table for social networking status updates. Inserting a record into this table will replace any previous status if the timestamp of the insert is newer than the previous timestamp, otherwise the previous record will remain and the new insert will be discarded. A status update record is associated with a Data record, in our implementation we will associate it with our Last.fm profile record. Status records contain the status text, a package name where resources are located, an icon resource, and a label resource. 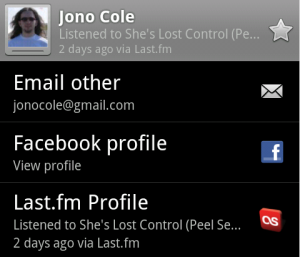 Below is a function that will insert a status update, as well as updating our Last.fm Profile Data record to display the last track the user listened to. Note that for efficiency purposes, we will send all the updates in a single batch, so Android will only run a single aggregation pass at the end. Now that we have our utility functions written, we can fill in the body of our performSync method. We’re going to take a very simple approach to syncing: we’ll grab the list of RawContact IDs currently associated with Last.fm usernames, and we’ll create a RawContact for any Last.fm friend that doesn’t currently have one. If a RawContact already exists, we’ll fetch their most recent track and post a status update. Note that this is a one-way sync, we’re not dealing with local deletions or changes. By default, new contacts that you create from your sync provider are not shown by the Contacts app. Instead, it will show only contacts it has aggregated with other visible sources. To enable the display of contacts that only exist in your provider, press the Menu button and select “Display options”, then expand the entry for your account and tap the checkbox next to “All Contacts”. This is a good default, as I don’t really want my address book to be littered with hundreds of twitter contacts! The Android platform is awesome. The lack of documentation, however, is quite disappointing. While it’s great that I can dig through the system source code while troubleshooting and figuring things out, I shouldn’t have to! Sync providers require Android 2.0, which is currently only available on 2 devices. The Account modifications I made to our login activity will need to be reimplemented using class introspection in order to keep compatibility with Android 1.5. This sync provider is far from complete — I still need to figure out how to control the sync interval, set my sync provider as read-only since local changes are ignored, I might grab the user’s avatar if they don’t currently have an icon, and add a fancy “Do you want to sync your contacts?” popup to the login process similar to Facebook’s. Hopefully this will help other developers out there struggling with the lack of documentation, as I’m looking forward to seeing twitter status updates in the contacts app in the future! I do this in the performSync method if there isn’t a periodic sync already set up. Your sync adapter really helped me a lot. However I’m struggling where ronem got stuck. I’m using the sync provider in the android samples and am able to sync in the contacts. However, I want to launch a new activity on the click of the profile and this is not a success even after I have added the activity to the android manifest and have defined the proper mime type(as in contacts.xml) as described above. Am I missing Something………..Are there any further steps needed?………….Any help would be greatly appreciated. When i am going to add a contact with sample sync account. It is showing only two fields. How i can see all fields like email,organization. I want to sync all fields. Who starts the ContactsSyncAdapterService , why did you use android:process=:contact ?. im phone it is not being called by the system, can we start onPerformSync() on demand?? Hi Sam, Thanks for the great article and sample! 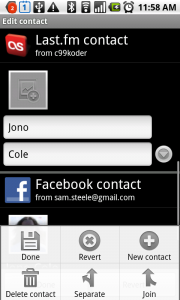 I’ve created an app which adds user info to contacts, and it can be called from the contacts Quick contact badge. However, I met an issue after uninstalled the app the user info are still left in contacts and the contacts crashes when I click that contact, it said “Couldn’t find authenticator for specific account type”. Do you know what’s the problem and how to fix it? Thanks very much. how to add another sync item such as sync calendar in the Data & synchronization category. how to design the interface? does it need another service or adapter to sync the calendar. What’s more, if I want to custom the item, how can i do ? When writting the sync-adapter, accountType must be fill with something (if it is not it will crash the contact app and eventually the phone). But do you know if there is a way to set a default accountType ? I mean i want my app to add (and a ContactSyncAdapterService) a new field in each contact who already exist, so i don’t need to create a new contact type, do i ? One question i´ve made the tutorial but updateContactStatus() is never call. Your two posts will help me a lot. inspired by your works I’m writing a bidirectional sync-provider (android:supportsUploading=”true”). I have near the result: I have obtained that when I add a contact (via phone GUI) the phone request on which account I want add the new contact. BUT after I select my sync-provider the GUI allow me to insert only name and surname, no others infos (phone, mobile, email …). If you have a guru-suggest I will appreciate it. Can you send the source code to me? I am having the same problem a Brian except his solution does not work for me. Initally I could not add or edit contact to accounts provided with this provider. 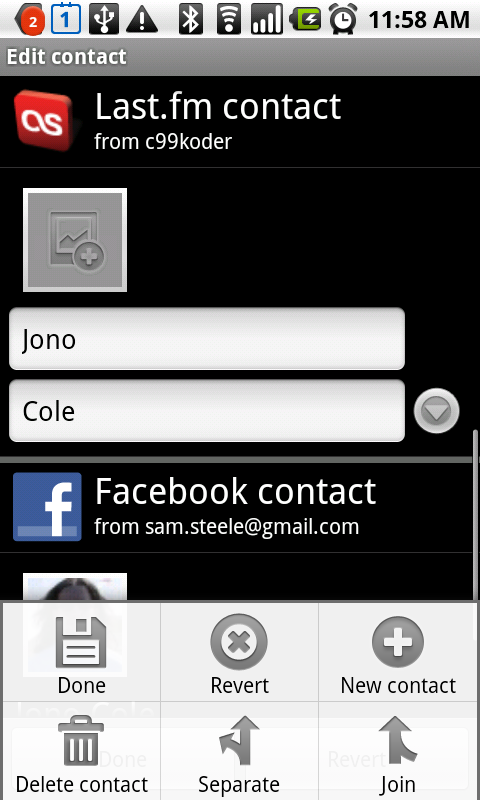 After his fix I can edit (contact added with myPhoneExplorer) but not add contacts. This is with both the tutorial and downloaded demo. Should I be able to add new contact? I forgot to mention that I am running 4.1.2 and seeing same thing on both phone and emulator. @Dominic No, you should not be able to add contacts, this tutorial is for a read-only contacts source. To enable adding contacts, you need to change android:supportsUploading to true in sync_contacts.xml, and add syncing logic to your adapter. I want to know if the custom data I will add to those contact that bleong to my Syncadapter will be modifiable by other app. I want to prevent that, I mean I don’t care if people can read that but I don’t want them to modify it. Is it possible? if so can you point me how. I am using your code but this code is adding only one contact at a time, but I want to add multiple contacts in my contact list at a time, how it can be possible? thanks in Advance….